Hey, remember early in the year when I was worried about Felix’s missing velocity? Yeah, about that… you can stop worrying now. No, it’s not just because Felix has been ridiculously awesome the last few months, putting to rest any questions of whether he can succeed without a 95 MPH fastball. Given how good his change-up, curveball, and slider are, we were already pretty sure that was true. Instead, it’s because over the last month or so, Felix’s fastball has returned, and there’s not much difference between what he’s throwing now versus what he was throwing at the end of last year. I know that graph isn’t the easy thing in the world to read, given that it goes all the way back to ’07, but focus on the right hand side of the image. You can see a big dip in maximum velocity at the beginning of the year, back when Felix was topping out at 92-93 and only hitting 94 on good days. Well, look at the max velocity in the last month or so – consistently hitting 95. On June 1st, Felix averaged 92.0 MPH with his fastball for the first time all season. He then repeated that velocity (or beat it) in nine of his next 11 starts, and he’s been sitting at 93 for the last month. That is right in line with what he was throwing in the second half of 2011, and the upwards trend is comforting, especially as he carries another large workload this year. Mid-20s Felix doesn’t throw as hard as early-20s Felix, and velocity isn’t central to Felix’s success, but I feel a little better about things with him throwing 95 again. Not that he ever really gave us reason to be worried, but if you had any lingering concern about where his fastball went, you can probably put those to bed. It’s back, and so is ridiculously dominant Felix. Awhile ago, Felix watched himself on video and ended up making a mechanical tweak. I wonder if that is directly related to his velocity coming back? Something wonderful to bank in another wretched season. A Felix injury would have been brutal. Good to know it was more mechanical than anything else. thurston24: Shannon Dreyer wrote about it in her June 6 post available on archive. I have been wondering the same thing and wonder if he watches his video now as a matter of habit. SD reported that Felix was stunned by what he saw. If the M’s think they can be good from 2014-2017, then I’d offer Felix an extension at $20M for 2015-2017. Either that, or tear up the old one, and give him about $110 over 5 years to go from 2013-2017, or so. Perhaps you could even put him in for something crazy for 2013 like $30M, so that in 2014 and beyond it will be easier to sign a couple bigger free agents. Especially given that this team is on pace to spend about $50M next year. If Felix was stunned by what he saw, does that mean the pitching coach didn’t notice, didn’t watch those tapes, or was he waiting for Felix to ask? Brenden Ryan is going to be a 2 win player (aboutish), and probably is only going to make 2.5M a year or so from his 3rd year of arbitration. Hooray for undervaluation of defense! Jason Vargas, however, is going to get severely overpaid if he keeps this up. Yeah, those 13-strikeout, no walk two-hitters are becoming practically routine. Remember that commercial with Edgar Martinez where he keeps asking the batting coach if his swing looks okay, and the batting coach doesn’t even looks and says “Yeah, Edgar, it’s great.” Probably like that. I’d forgotten how that one ended. Just wait for it. It’s great. I don’t want to say this the wrong way, but – when it comes to Felix’s reaction to watching video (back when he was “struggling”), I’d take everything that’s said with a gigantic grain of salt. Reporters like to create mountains out of molehills. It’s like when a hitter is struggling, and reporters will keep asking what he’s doing wrong and the guy has to say something – but, in reality, most of the time he just needs to keep plugging away and doing what he’s always done. Given a chance, things just sort themselves out much of the time. We don’t know if the pitching coach ever said anything. If he didn’t, maybe he didn’t feel he could approach Felix… or, just MAYBE, he didn’t think there was anything wrong. Going to be a tough decision on Felix. Seems like this would be the off season to extend him if they want to hope for any sort of discount or shorter term, maybe add 3 years at 22 per? Can’t imagine what the competition would look like if he gets to free agency. He could probably get 7yrs at 25-26 per. Just insane territory for a pitcher, even a young one. Really curious as to what Dave and others think on this subject. 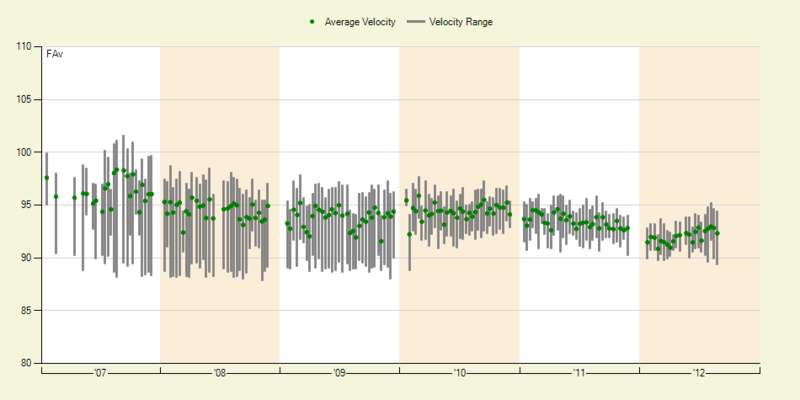 Why do the velocity ranges get progressively smaller each season? And was Felix really hitting 102 back in ’07? FELIX!! Hopefully he makes a strong push for another Cy Young..
Mariners don’t seem to have much money locked up in the future, so I don’t see why they can’t resign him.. But then what if they could get an enormous return for him in a trade? I’d like to see the experts around here show their opinion on the subject. Ansioso para o jogo de hoje à noite, mas acho que vão dormir! I see you got your internet working right away – good to know you’ve got your priorities straight! Haha, thanks Westy. I wrote that before I looked at the schedule! The last 48 hours have been a blur. I have been trying for months to determine what package Felix would land right now. Any theories? Obviously every player has a price. What would you (anyone who can coment) require to relinquish The King? If Felix hits free agency he’ll be a $30 million dollar man. There’s just not a comparable guy out there, that a) has his consistency, year in year out b) has a proven record and yet is still young, and c) has NO injury history, while being a fastballing innings eater. The bidding would be outrageous from the “big boys”. So I agree with folks who think we need to wrap him up NOW if he’s gonna stay in Seattle. Or (gulp) we need to package him now, while he still has time on his contract. But ownership needs to decide– are we gonna try to be contenders anytime soon, and up payroll, because if not we can’t afford a $22 million a year extension on an $80 million a year team. My feeling is that his incremental improvements from season to season in both command and what I think amounts to “pitching IQ” are causing him to now approach total mastery over the art, and are easily outpacing the minor degenerative loss of velocity that occurs naturally with age, which to me means he is, despite all rational expectations, somehow still getting even better at this point. I feel like I’m watching the second coming of Pedro Martinez, with the potential to be even better than him. If he ever pitches in another uniform I will weep like a newly orphaned child and may never stop. –I’m approaching this irrational state myself, and I don’t feel the least bit bad about it. I don’t really care what we could get back in a trade–whatever we’d get in return would then have to be ready for the Majors AND proceed to pan out (reach potential) in Seattle (dicey proposition IMO) and for my money, would have to also be something so extraordinary and rare that we couldn’t have found something comparable in the next year’s draft using our own picks. So, McCutchen, Gerrit Cole, Jameson Taillon, Pedro Avarez, and Stetson Allie for Felix? I’d possibly consider something on that level. Don’t try to talk me out of my irrational love of Felix–I am fully prepared to ditch this franchise after 30 years of fandom if they ship Felix out for prospects under the proviso that we can attempt to be more competitive a year or two earlier if only we had more top tier prospects. I hope they resign Felix. He’s gonna be hella expensive, but they should do it anyway. Isn’t 2015 when the existing TV deal is over, and the Ms can renegotiate for a much better deal and have more $$$ to spend? Every GM will listen to offers and no player is completely untouchable, unless there’s a no-trade clause, and the player wont waive it. If Jack were offered an arm and a leg for Felix, I’m sure he’d see if he could get the other arm & leg. I’d love to see Felix get extended again. I don’t wanna see an equal value trade, even for a proven MLB hitter(s). But if it were to happen, I would hope that it’s something lopsided, where the risk is overwhelmingly higher for the other team. Kind of like the Hershel Walker trade, where the Vikings pretty much bet it all. Funny thing is, Felix is a far better player at his position and sport, than Walker ever was. Having said all that, I’m just glad he’s a Mariner, that he’s still under contract, and I continue to look forward to each of his starts. It looks like the variance in velocity has gone down every year. Is this due to Hernandez’s continually improving “command” and consistency, or is it a hallmark of improved Pitch F/X data? Either way, I’d bet you could write a nice paper about pitch speed/location/break consistency and pitching outcome. Please write a piece on how YOU would FIX the M’s. Can we have an OFer from our minors who could actually hit worth a damn sometime soon, pretty please? It’s only been a couple of decades since we’ve had one from our minors that we’ve kept for very long. Usually we screw up and trade them as rookies for magic beans. Hopefully you’re smart enough not to do that.